Following article is from The Star-Ledger dated Sunday, 8-8-10. 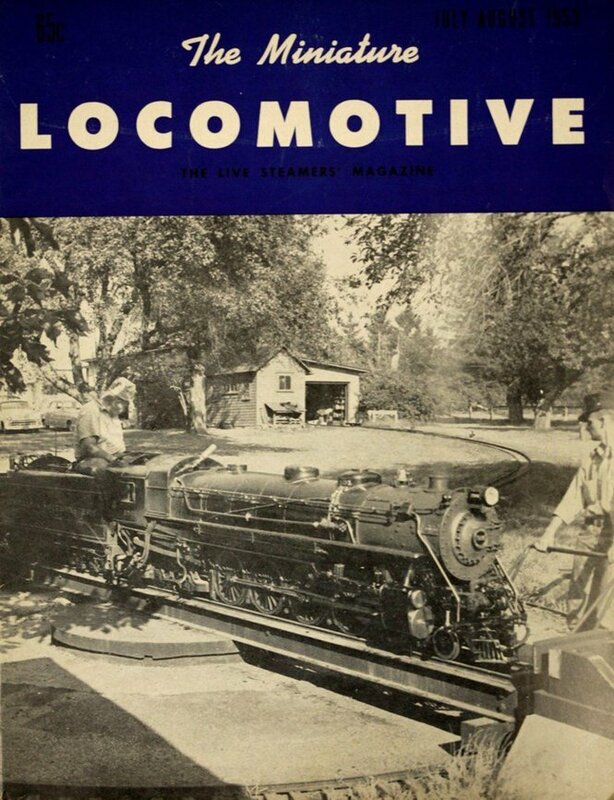 It discusses efforts to bring this miniature locomotive back to Roseland, New Jersey. The people working on this project want to have the locomotive stuffed and mounted and displayed in a museum in Roseland. Personally, I think it should be refurbished and put back to work hauling kids. ROSELAND — Tom Rose still carries a black-and-white snapshot of his boyhood ride on a miniature railroad pulled by a 7,212-pound locomotive. The year was 1953. He — just 10 months — is in the arms of his mother, Leona. Every year, until the attraction’s last whistle stop in 1972, he rode the rails through idyllic pastures on the Becker Farm and Dairy. For thousands of others, as well, recollections of the train have been etched in their childhood memories. The taste of chocolate milk after a ride on “The Fresh Milk Line.” The twists and turns of the coal-fired workhorse pulling as many as 16 cars and 100 passengers across two miles out and back. Now, Rose is on a trek to bring the old Centerville & Southwestern Railroad’s steam-powered Locomotive 1501, which is sitting idle in a Michigan warehouse, back to Roseland. The train, said Rose, a 57-year-old railroad enthusiast, is a great piece of American ingenuity that could be coming home. In its day, the miniature railroad was a marvel. It was featured on the pages of “Popular Science” and “Mechanix Illustrated.” In stories, now deceased farmer and dairyman Henry Eugene Becker touted it as the smallest railroad with a strict schedule of runs. Last year, Rose tracked the railroad’s flagship steam locomotive to a private collector in Royal Oaks, Mich. Rose, who is always on the prowl for C&S memorabilia, even traveled out to see it personally and learned that the collector, who wants to remain anonymous for now, is interested in donating the locomotive back to the town of Roseland, Rose said. Ever since Rose learned the train could be coming back to New Jersey, his wheels have been spinning. He lined up support from Roseland’s governing body, which last autumn voted to accept the No. 1501 as a donation and offered up the historic firehouse at Eagle Rock and Harrison avenues as its new berth. He has enlisted Joseph Ditrolio, a 59-year-old Roseland physician whose father was once the vice president of Lionel Trains, to help with fundraising. Much of the railroad in Centerville — which was Roseland’s name until 1908 — is now with the Phillipsburg Rail Road Historians in Warren County, which runs some of the diesels on a short stretch of track. But Rose wants to bring the line’s flagship steam locomotive back to where it came from. “That’s where it was,” said Rose, who is now 57. The railroad’s run came to an end in 1973. Becker found a home for it at the Henry Ford Museum in Dearborn, Mich., and shepherded it there himself. A decade later, the museum decided that the railroad was no longer a good fit for its collection. It fell into private hands in October 1985. All along, it has lived on in the memories of the thousands of children — and adults — who rode its passenger cars pass Peach Tree Junction and into the cool woodlands on a summer day. One of those was Karen Kleppe Lembo, the Caldwell Public Library director who has been assembling pictures by the late photographer Gene Collard, who spent a lifetime capturing images of his surroundings, the circa 1940 No. 1501 among them. At a lunchtime get-together with Rose, she pulled out an old scrapbook, revealing a 20-cent ticket for a ride she and her cousin, Edward, took on June 20, 1964. One particular memory jumps out. “Edward and I had chocolate milk!” she said.